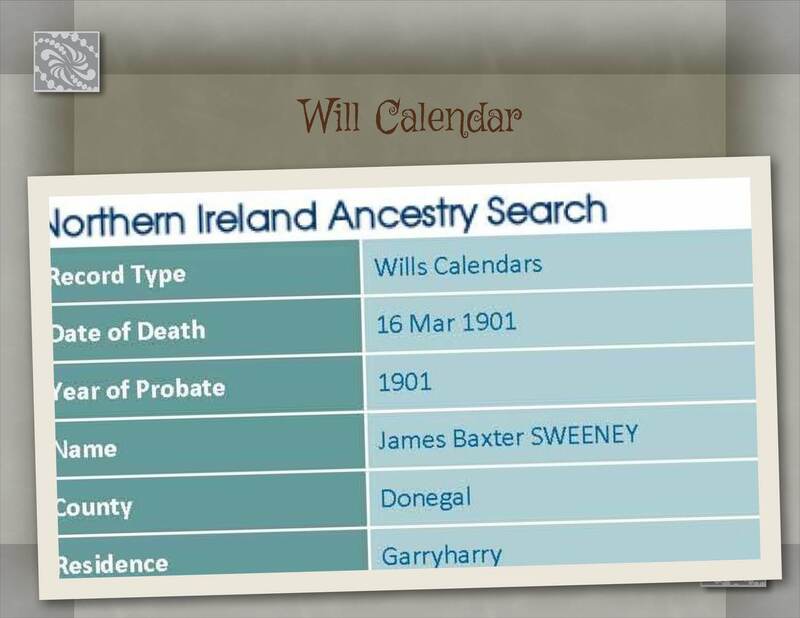 James Baxter Sweeney is my 2nd great grandfather; and from the limited information I have on him it would seem he was born about 1834 in Letterkenny, Co. Donegal. James father was also James Sweeney and his mother was Mary. Unfortunately, I don’t know Mary’s maiden name for sure; however, due to the often used naming patterns… she might be a Baxter. Much more evidence is required to substantiate this belief. At some point in time, in his mid twenties; James met and married Fanny (Frances) Robinson. Her parents were James Robinson and Margaret, whose maiden name I’m also searching for; from Garrowcarry, Edenacaran, Co. Donegal. 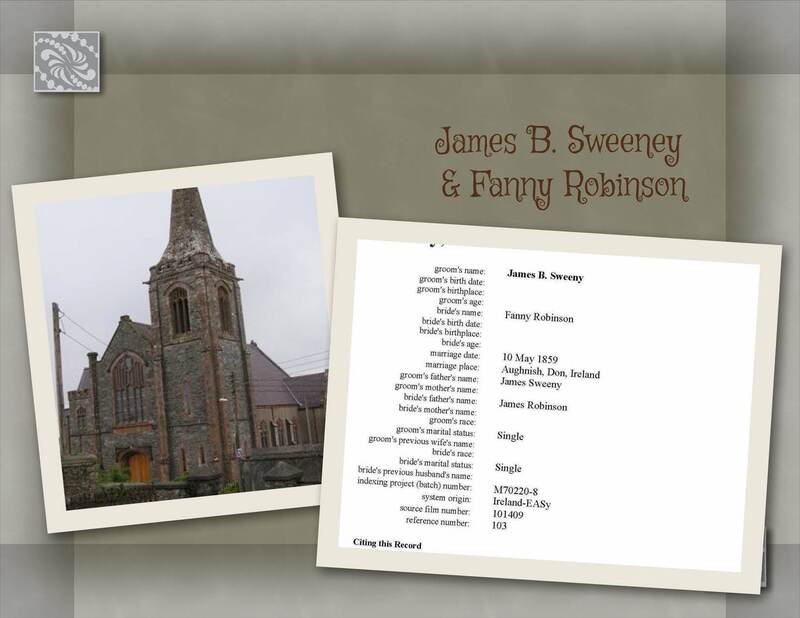 James & Fanny were joined in marriage at the Ramelton 1st Presbyterian Church in Aughnish, Milford. David Stevenson and William Ritchie witnessed their wedding. James and Fanny had a large family; comprised of six sons and four daughters. Their youngest daughter was Lizzie, who is my great grandmother. In 1875, at the time of her birth; the family was living in Church Hill, Co. Donegal. 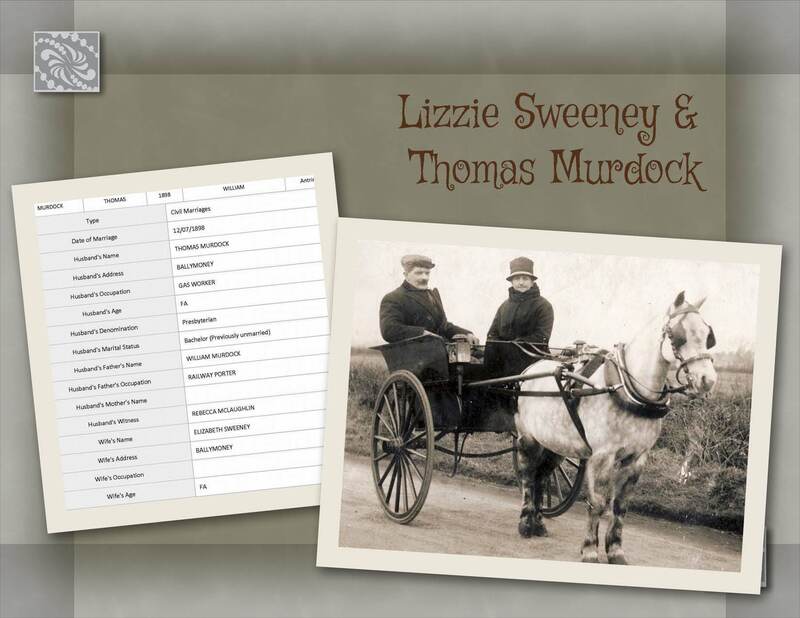 On July 12, 1898 Lizzie’s marriage record to Thomas Murdock, my great grandfather; shows that the family was living in Garryharry, Letterkenny. The record also reveals that James was a farmer. I’ve since discovered that some of his sons where cattle dealers in the area. Who are William J. Wilson and Samuel Russell: Two more “Twisted Limbs & Crooked Branches” to follow to find a connection! 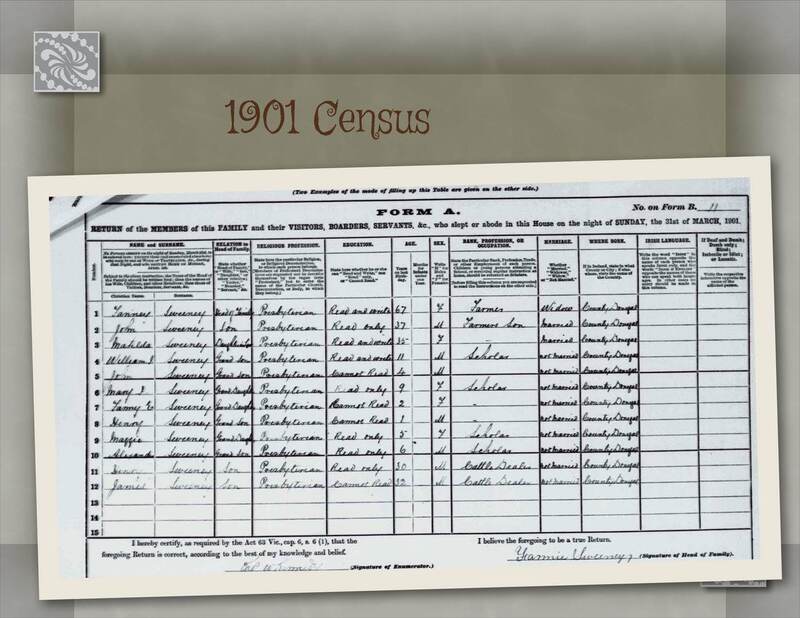 The 1901 census shows that Fanny, who was widowed; was residing at 11 Garrowcarry, Edenacarnan, Co. Donegal. The census records reveal that her son John, his wife Matilda and seven of their children; along with her sons Henry & James, the cattle dealers; were also living in the same place. Although Fanny was widowed; I can’t imagine that she ever felt alone. Sadly too, by 1909 my 2nd great grandmother Fanny also had passed away. So much more to find out about this particular “crooked branch”! Copyright (c) (2014) (https://colleenjmurdoch.worpress.com). All Rights Reserved. 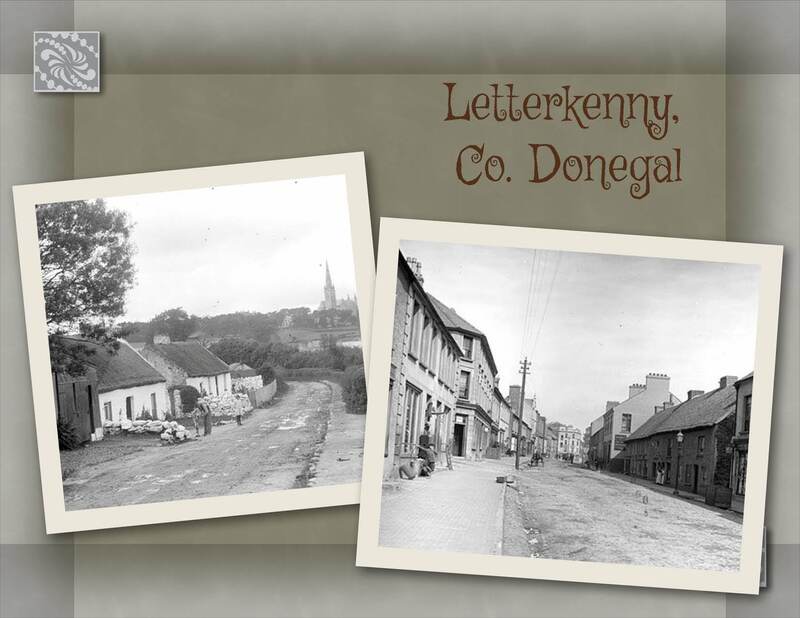 This entry was posted in Co. Donegal, Family History, Geneaology, Ireland and tagged Co. Donegal, Family History, Geneaology, Letterkenny, Murdoch Family, Robinson Family, Sweeney Family. Bookmark the permalink. Colleen, Oh Donegal! I have ancestors from this region but they came in 1732 and 1790’s. I haven’t been brave enough to start the research in Northern Ireland yet. I look forward to reading your blog for ideas! Also, on a purely blog note – I like the way you integrate the pictures and research. It’s very readable and appealing. Thank you for the kind compliments Rachelle. If you need any help with the Donegal area, I’d be happy to give you a hand. It seems many of my family were from there. I will be heading “back home” at the end of July for 3 weeks and Donegal will definitely be on the itinerary. I have many living family in Northern Ireland; but since I just recently found distant cousins in Donegal I’m hoping to meet up with them too! They just don’t know it yet! 😀 Thanks for reading and don’t be shy to ask for help once you’re researching Donegal.